8 July: Captain-Major Vasco da Gama sails out of the Tejo estuary on board the Sao Gabriel accompanied by three sister ships in search of “Christians and spices”. 15 July: The fleet passes the Canary Islands and soon spots the African coast. Limited contact is initiated with tribes along the coast as the voyage progresses. 4 November: The fleet reaches the Bay of St Helena. 22 November: The fleet rounds the Cape of Good Hope at midday. March 2: The fleet reaches Mozambique. 7 April: The fleet reaches Mombasa. 14 April: The fleet reaches Malindi thirty leagues north of Mombasa. 24 April: The Yemeni Sultan of Malindi provides Gama with a Gujerati pilot who steers the fleet towards Calicut on the southwest coast of India. 20 May: The fleet anchors at a small village near Calicut. 21 May: The first Portuguese to land ashore, a converted Jew, comes across two Castilian speaking Arab merchants. ‘The Devil take you! What brought you here?’ they ask astounded. ‘We come to seek Christians and spices’ replies the Portuguese. ‘You should give many thanks to God for having brought you to a land where there are such riches!’ an Arab explains. 28 May: After much preparation, Gama finally lands ashore accompanied by a retinue of thirteen Portuguese holding banners and blowing trumpets. A half naked native honour guard receives Gama in the presence of the Moors who act as interpreters. Gama is lifted onto a palanquin and carried to the Royal Palace accompanied by the sound of drum beating while large curious crowds converge to watch the procession. The bare-chested Zamorin, reclining on a green cloth covered couch chewing pan which he regularly spits into a gold pot, receives the Portuguese in this manner. They bow respectfully and are offered fruits which they consume in an unfamiliar manner that greatly amuses the Zamorin and his court. Gama explains that he has come as the emissary of Manuel I, the king of a powerful kingdom seeking trade with India. 29 May: Gama assembles gifts to offer the Zamorin. These consist of coats, hats, basins, honey and butter. When the local Moorish merchants see what Gama has to offer they burst out laughing. He is left embarrassed and offended. 30 May: Gama is made to wait several hours for his second audience with the Zamorin who does not hesitate to reproach him for the measly goods he has brought. Slyly, he makes a reference to a valuable Virgin icon in gold said to be on one of the ships but Gama explains that he cannot part with it as it is a lucky talisman. Nevertheless, the King grants Gama permission to return to his ship and begin trading. 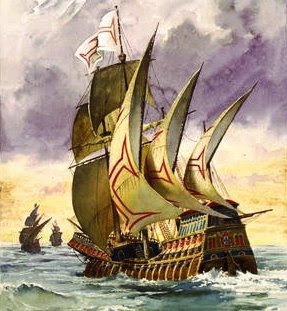 2 June: After some tense moments on the way back in which Gama is separated from his men and temporarily detained by the Moors, he climbs aboard the Sao Gabriel. Relations with the Moors deteriorate rapidly over the coming weeks. When the Portuguese land ashore, the Moors greet them with the words ‘Portugal, Portugal’ before spitting on the ground. 13 August: The Portuguese suspect that their Arabic speaking emissary, Diogo Dias, is detained by the Zamorin from fear that they will not pay the 600 ashrafis they owe in customs duties. 19 August: When senior Calicut officials approach the fleet on several vessels for discussions, Gama has them seized and held hostage until Dias returns. 23 August: As there is no response, the Portuguese prepare to set sail for Lisbon leaving a message behind for the Zamorin and his court stating that they plan to ‘return very soon, and that they would then know if we were indeed robbers’. 26 August: While the fleet is temporarily stopped at sea by the winds, a vessel arrives from Calicut bearing news that Dias is safe and the Zamorin is prepared to negotiate. Gama insists on his immediate return threatening to behead his captives if this is not done. 27 August: Dias arrives on a vessel in the morning and six hostages are released. The Zamorin sends an amicable palm leaf message stating: Vasco da Gama, Fidalgo of your household, came to my land, and I rejoiced at that. In my land, there is much cinnamon, and much cloves and ginger and pepper and many precious stones. And what I want from your land is gold and silver and coral and scarlet.